So, this morning a picked up my son,s 45 lb. Paul Bunyon bow, after reading yesterday,s thread.I tied 10 strand ff d97 for it ,but my padded loops were to large for the knocks.So i had a 10 strand b55 string i put on it for the test.Here are the results.45 lb bow at 27 inches of draw. The bow shot to my surprise a 350 gr arrow at 156 fps.It shot a 410 gr arrow at 150 fps,and it shot a 450 gr arrow at 145 fps.That is right on par with my selfbows.The bow is , quiet, and smooth with a little hand shock.It is beat up ,but shoots really nice.Now if i would have shot a 10 strand ff string ,and pulled 28 inches there would have been at least ten more fps added to those numbers above.I AM IMPRESSED.Just thought you guys would be interested in the results.At 15 yds and in it would be lights out for a whitetail for sure.How do i know this, because over the years i have done it many times with my selfbows. So if you really want to harvest a whitetail with one of these bows go for it. If you do your job ,it will do it,s job. Interesting. I had a Paul Bunyun fiberglass bow. It was 55# and had built in brush nocks. Kind of weird looking and it did have noticeable hand shock. I should have kept it, I would have liked to have shot it with a D97 string. It is really a fun bow to shoot.I steel wooled it,and painted after i shot, and it does not look bad now.This is my son,s bow, but he will get it back after i pass, and not until then.Nice piece of history if you love bows. Our history may look a lot different had not the fiberglass bow came along after the war. Almost unbreakable, and you could buy one for less than $10.00....some less than $5.00. They helped build the ranks of bowhunters that may not have otherwise afforded a bow at the time. Easy to look back nowadays and call them dogs or whatever. I remember that you could buy a whole kit..arrows, bow, armguard and tab for less than $20.00 and you got a target with it. Nice piece of history for sure, and only God knows how many people got into archery because of them. 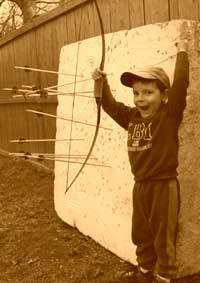 Yes, this was my first "store bought" bow, except that I won mine by selling newspaper subscriptions for my paper route in the late 50's. Wonderful memories of that bow and it's rock solid dependability. As with most bows, it shot better than the archer and left NOTHING to be desired. Later in life, I picked up a couple more from the auction sight and they are still shooting well and strong. Arne,nice to hear from you. Watch your excellent utube vids on form to brush mine up all the time.Those fiberglass bows bring back a lot of nice memories.My brother Gene walked a total of 18 miles to get his first fiberglass bow.It was pink.Do not remember who made it.I watched him practice with that bow all the time.Then when i got older i shot it.I think you ,and i ,and George are around the same age. Those were the days my friend we thought they would never end.Keep em flying, and good health to you and George and everyone else on this thread. Here is my first bow, a Bear Green Fox bowhunting set that my Dad bought me in 1969. It came with a 45# all fiberglass bow, arm guard, shooting tap, slide on quiver, four arrows with bear razorheads, and a target. Killed my first deer ( a doe ) with it in 1971. I still have the bow, but the rest of the set is long gone. Them fiberglass bows sure bring back some good memories. Thanks Bassman!! Yep, "those were the days..."
I still check this sight out several times a day but anymore, only tend to respond to form and shot execution questions. There's too much (poor) "discussion" on many topics that I just don't want to get into anymore. Grizz was nice enough to send me one in 45#. I am in the process of cleaning it up a bit as I type this. I have shot it at my outer limit and have really become a fan of how it performs. I plan on using this bow this hunting season if given the opportunity. I know it will get the job done. I plan on wrapping the riser with Paracord and going with rubber for string silencers just to keep it weather proof. It ought to shine on those dreary days. Anyhow Bassman, thanks for the update, but i knew mine was shooting pretty quick after the first few arrows. Confirmation it's a dog. My first bow was a solid fiberglass Stemmler. I was 8 years old and knew immediately it was a dog. So, at age 10, my mom bought me a solid glass Ben Pearson. That's the bow I used to take the famous gopher from right under the feet of the Hormel guards. I couldn't wait to replace that dog. I replaced it was a solid glass and magnesium 76er and took my first deer, in 1975. I knew it too was a dog but had to hunt with it. Today, I have a no dogs allowed sign on my range and shoot my Hoyt, Drake and Bear Custom Kodiak TD. I'm a happy camper! Hey JOE To each his own. They wrote a song about it.I too have many quality vintage bows that will match or exceed the bows you have mentioned above.These young guys today that shoot Border,Uuka, Morrison, hoyt, trad tech are saying the same thing about your bows"dogs". It is all relative my friend. My first bow was made from a chunk of lilac. It shot great, for a four year old. My next bow was a wooden stick with real Indian paint on it and real suction cup arrows, it was not as good as my first bow. Then I got a real bow a 54" Pearson fiberglass recurve. A red ground squirrel killing masterpiece with a sight window and everything. There are NO bows out there, made today or in the past, that can match my bows, let alone exceed them. None at all! Joey,Joey,Joey.........I so wish we lived within a short drive of each other. You with your Bear TD and bedroom slippers on and me with my chunk of fiberglass Shakespere would have the "shoot off of shut offs". I know you don't like going past 10 yards and prefer about 4 less....no problems, my chunk of glass will cover me with whatever you choose. And when the "shoot off" would be over, I would be sympathetic to all the reasons (excuses) why the "fastest, best performing, bow" could not oust a "simple" piece of glass. But the distance will keep it from happening and I will just have to continue to listen to all this jibberish. Oh well. People in Bemidji right now are plotting to raid Frisky's house. Guess I am gonna find out for myself. Traded for a Paul Bunyan just now. Curious what it will scale at my draw. Might just shootna hog with it. I'm a big fan of the solid fiberglass bows as well. When it comes to "using" bow, they can't be beat. I was a big fan of the old Ferret recurve that had solid fiberglass limbs. It wasn't "trendy" though, so is didn't stay in the line up. I'm pretty sure it's a model 300. So it should be some where around 55 to 60lb @ 28"
I will most likely draw it 29", with that flat grip, but we will see. What did you trade for that Bunyan? A pair of old shoes? No ,JOe He traded a Drake ,Bear custom, and a Hoyt plus 100 dollars to boot, and he got a free dozen arrows out of the deal.Ha HA. I will let Don tell what I traded, if he wants to. Update, i shot the Paul bunyan bow with a 10strand d97 string and chronied it. Shot a 450 gr arrow at 155fps my draw, and 161fps at 28 inches.Raised the brace height, and arrow rest , and put one more wrap of leather around the handle.Nice bow for just a hunk of fiberglass.If you own one you owe it to yourself to try it out. I guess I would have traded a couple of deer livers I've had in the freezer for years. Just for the sake of it I took today my Paul Bunyan 100 #50 and did a speed test. I checked the draw weight and it came #48@28" - my draw length. With 475 gr arrow (CE 3050 30" and 200 gr fieldpoint ) I got an average of 156fps. Not bad for this old bow. I don't have a chrono, but I would roughly guess it is shooting about the equivalent of a laminated bow that is 5# lighter. Then again, I have a relatively long draw length.